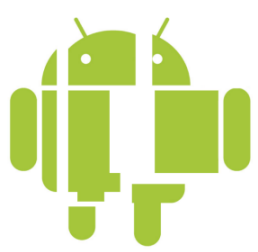 Android 4.2 Announced: Photo Sphere, Gesture Typing, Multi-User, TV Connect, Quick Settings, and Much More! Retaining the code name from Android 4.1, 4.2 is a revamped version of Jelly Bean. Despite the lack of name change, 4.2 offers various new and exciting features. Join us as we take a closer look at some of the highlights! Not too long ago, Google gave us native support for panoramic photos with the launch of ICS. However, in their eyes, a standard panoramic shot doesn’t properly convey the feeling of actually being there. Photo Sphere takes us one step closer. Once Photo Sphere mode is enabled, the app first guides you as you move your device to capture the entire scene. By using the same technology employed by Google Maps Street View, Photo Sphere then stitches the shots into a 360-degree view that allows you to pan and zoom, as you would in Street View. Those wishing to look at photo spheres from photographers around the would can do so as well. In addition to Photo Sphere, the Camera app’s UI also been updated with gesture controls. Thanks to the gestures, the interface no longer obscures the photo being taken with various controls. Instead, the app now makes full use of the screen real estate so that you can take better photos. Taking a page from Swype’s play book, the new keyboard built into Android 4.2 has slide gesture functionality. The heavily revised keyboard differentiates itself from current versions of Swype, however, by showing predictions in real time, as you slide around your fingers. This isn’t the first time we’ve seen real time gesture recognition—dubstep aside. That said, the interface looks to be better on Google’s latest offering, but the real test will be in actual day to day usage. The dictionaries have also been updated, as has voice recognition. Well, it’s finally here. Multi-User support has finally made its way to the OS officially. Each user is given his or her own personal space, complete with a customized home screen, background, widgets, apps, and games. While we don’t have access to the source code to verify, this is likely accomplished by sectioning off the /data partition between users. Interestingly, switching between user profiles is done via fast user switching, rather than completely logging in and out. Naturally, this feature is only available / practical on tablets, but you can bet your bacon that this will find its way to phones in the coming months, after 4.2 is released to AOSP. Many were disappointed to learn that the Nexus Q was only able to stream Google Play content rather than supporting full device mirroring. Problem, no more. In Android 4.2, users will be able to wirelessly mirror their displays to various supported devices. While we can’t speak in regards to additional functionality for Google’s enigmatic black orb, we can say that this will truly be a useful feature if executed properly. The underlying technology is the new industry standard Miracast, which was created by the Wi-Fi Alliance, and is based on Wi-Fi Direct. A fun, new feature present in 4.2 allows your device to display photo albums, news, and more when your device is docked. Remember AP’s video showing the “future site of quick settings?” It’s finally here. Google has now added a separate panel to the notification bar that can be accessed by a two-finger swipe from the top of the screen or simple button tap in the upper right corner if the notification tray is extended. Once summoned, it gives you quick access to user accounts, brightness, device settings, WiFi, Airplane Mode, Bluetooth, Battery, and Wireless Display. 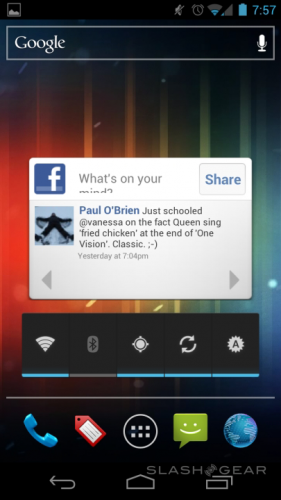 Much as we have seen in third party applications, Android now natively supports widgets on the lock screen. In fact, you can now add several pages of widgets to your device’s lock screen, essentially giving you a home screen—before you get to your home screen. Memetastic. Google Now was also updated with more cards. A good example of this is how the software can pick out shipping updates and flight details from your email, and display them in a context-relevant manner. This, however, is not exclusively tied with the updated OS, as those with devices running 4.1 can access the update today. There’s no doubt about it. Android, especially Ice Cream Sandwich (ICS), version 4.0, already offers more than what is coming in Apple’s forthcoming iOS 6. But, Android has its own flaws. True, as Tom Henderson, principal researcher for ExtremeLabs and a colleague, told me, there’s a “Schwarzschild radius surrounding Apple. It’s not just a reality distortion field; it’s a whole new dimension. Inside, time slows and light never escapes– as time compresses to an amorphous mass. I wouldn’t go that far. While I prefer Android, I can enjoy using iOS devices as well. Besides, Android fans can be blind to its faults just as much as the most besotted Apple fan. For example, it’s true that ICS has all the features that iOS 6 will eventually have, but you can only find ICS on 7.1 percent of all currently running Android devices. Talk to any serious Android user, and you’ll soon hear complaints about how they can’t update their systems. You name an Android vendor-HTC, Motorola, Samsung, etc. -and I can find you a customer who can’t update their smartphone or tablet to the latest and greatest version of the operating system. The techie Android fanboy response to this problem is just “ROOT IT.” It’s not that easy. First, the vast majority of Android users are as about as able to root their smartphone as I am to run a marathon. Second, alternative Android device firmwares don’t always work with every device. Even the best of them, Cyanogen ICS, can have trouble with some devices. Besides, while Cyanogen supports many smartphones and tablets, it doesn’t support all of them. For example, there’s still no stable CyanogenMod 7 (Android 3.x) firmware for Barnes & Noble’s Nook Tablet. Sometimes even when there is support, such as there is for the popular Samsung Galaxy Tab 10.1, there are driver troubles that keep the camera from working for many users. Another issue is consistency. When you buy an iPhone or an iPad you know exactly what the interface is going to work and look like. With Android devices, you never know quite what you’re going to get. We talk about ICS as if it’s one thing-and it is from a developer’s viewpoint-but ICS on different phones such as the HTC One X doesn’t look or feel much like say the Samsung Galaxy S III. A related issue is that the iOS interface is simply cleaner and more user-friendly than any Android interface I’d yet to see. One of Apple’s slogans is “It just works.” Well, actually sometimes it doesn’t work. ITunes, for example, has been annoying me for years now. But, when it comes to device interfaces, iOS does just work. Android implementations, far too often, doesn’t. So, yes, Android does more today than Apple’s iOS promises to do tomorrow, but that’s only part of the story. The full story includes that iOS is very polished and very closed, while Android is somewhat messy and very open. To me, it’s that last bit-that Apple is purely proprietary while Android is largely open source-based-that insures that I’m going to continue to use Android devices. Now, if only Google can get everyone on the same page with updates and the interface, I’ll be perfectly happy! Android has always been Linux, but for years the Android project went its own way and its code wasn’t merged back into the main Linux tree. Now, much sooner than Linus Torvalds, Linux’s founder and lead developer, had expected, Android has officially merged back into Linux’s mainline. The fork between Android and Linux all began in the fall of 2010, “Google engineer Patrick Brady stated that Android is not Linux” That was never actually the case.Android has always been Linux at heart. At the same time though Google did take Android in a direction that wasn’t compatible with the mainstream Linux kernel. As Greg Kroah-Hartman, the maintainer of the stable Linux kernel for the Linux Foundation and head of the Linux Driver Project, wrote in Android and the Linux kernel community, “The Android kernel code is more than just the few weird drivers that were in the drivers/staging/androidsubdirectory in the kernel. In order to get a working Android system, you need the new lock type they have created, as well as hooks in the core system for their security model. In order to write a driver for hardware to work on Android, you need to properly integrate into this new lock, as well as sometimes the bizarre security model. Oh, and then there’s the totally-different framebuffer driver infrastructure as well.” That flew like a lead balloon in Android circles. This disagreement sprang from several sources. One was that Google’s Android developers had adopted their own way to address power issues with WakeLocks. The other cause, as Google open source engineering manager Chris DiBona pointed out, was that Android’s programmers were so busy working on Android device specifics that they had done a poor job of co-coordinating with the Linux kernel developers. The upshot was that developer circles have had many heated words over what’s the right way of handling Android specific code in Linux. The upshot of the dispute was that Torvalds dropped the Android drivers from the main Linux kernel in late 2009. In the event the re-merger of the two went much faster than expected. At the 2011 Kernel Summit in Prague in late October, the Linux kernel developers “agreed that the bulk of theAndroid kernel code should probably be merged into the mainline.” To help this process along, theAndroid Mainlining Project was formed. Things continued to go along much faster then anyone had foreseen. By December, Kroah-Hartman could write, “by the 3.3 kernel release, the majority of the Android code will be merged, but more work is still left to do to better integrate the kernel and userspace portions in ways that are more palatable to the rest of the kernel community. That will take longer, but I don’t foresee any major issues involved.” He was right. Today, you can compile the Android code in Linux 3.3 and it will boot. Still, as Kroah-Hartman warned, WakeLocks, still aren’t in the main kernel, but even that’s getting worked on. For all essential purposes, Android and Linux are back together again. Does Google’s Android violate Linux’s Copyright? Back in January, we talked a bit about the new MIT App Inventor software aimed at helping people that aren’t developers to build their own apps. 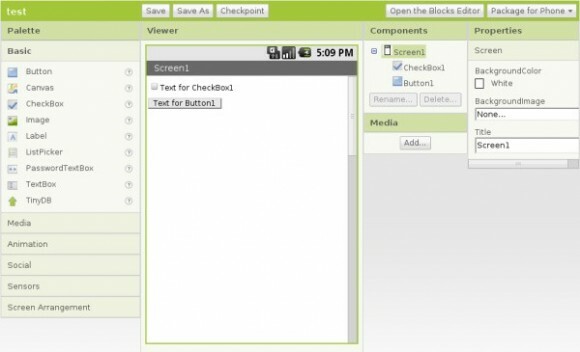 MIT promised to have App Inventor available in Q1 of 2012. The first quarter is quickly winding down, and it was looking a bit like MIT might not make its self-imposed deadline. MIT has now announced that it is meeting the goal of making App Inventor available as a public service in Q1. The App Inventor software has been in closed testing the last two months with 5000 users. The App Inventor software is now available in open beta to anyone who has a Google ID to login, such as a Gmail account. MIT points out that the software is suitable for any use, but users need to be aware that this will be the first time the system is loaded so heavily, which could cause issues. MIT suggests that users make backups of important apps as the service ramps up with more and more users, in case there are issues. MIT also notes that it is still working on fixing remaining glitches and other errors. We owe a large debt to our testers of the past few months; it’s been their feedback that’s given us the confidence for today’s announcement. And we’re tremendously grateful to the folks who have been running their own system with the MIT JAR files. Their experiences have been an invaluable source of information, and their work has been critical in keeping App Inventor alive while the MIT service was not yet available. We also want to acknowledge the growing group of developers who are starting to explore the App Inventor source code. They are the seeds of an open source community that we hope will take App Inventor beyond anything we could do by ourselves at MIT. And our extreme gratitude and admiration goes to the Google App Inventor team who, even while their project transitions out of Google, have continued to share their expertise and the fruit of their hard work of the past three years. If you’re a fan of Google’s augmented reality astronomy app Google Sky Map, I’ve got good news and bad news for you. Google announced that major development on the app has ended, so there will be no more major official releases from the company. On the plus side, they’ve decided to release the open-source code for Sky Map, so given enough developer interest it should be around for quite some time. Sky Map started as one of Google’s famous 20% projects, which six of its employees launched by working in their company-sponsored spare time. The application was one of Android’s first showpiece apps, combining basic astronomical data overlaid on a smartphone camera to easily identify constellations, planets and other heavenly bodies by simply pointing the phone towards the sky. The free app has been downloaded over 10 million times from the Android Market. Google is working with Carnegie Melon University so that its students can continue direct development. The company didn’t say if direct updated with computer scientist students’ code would make it into the android Market, but it’s a pretty safe bet. If you’ d like to give it a try for yourself, you can download the open-source code here. I fully expect a Star Trek themed version of Sky Map in the next few weeks which will allow me to view the Alpha Quadrant from my smartphone – get to it, devs. Did Google ever have a plan to curb Android fragmentation? Another day, another set of Android fragmentation stories. And while there’s no doubt that there is wide fragmentation within the platform, and there’s not real solution in sight, I’m starting to wonder if Google ever had a plan to prevent the platform for becoming a fragmented mess. OS fragmentation, though, is an utter disaster. Ice Cream Sandwich is by all accounts very nice; but what good does that do app developers, when according to Google’s own stats, 30% of all Android devices are still running an OS that is 20 months old? More than two-thirds of iOS users had upgraded to iOS 5 a mere three months after its release. Anyone out there think that Ice Cream Sandwich will crack the 20% mark on Google’s platform pie chart by March? OS fragmentation is the single greatest problem Android faces, and it’s only going to get worse. Android’s massive success over the last year mean that there are now tens if not hundreds of millions of users whose handset manufacturers and carriers may or may not allow them to upgrade their OS someday; and the larger that number grows, the more loath app developers will become to turn their back on them. That unwillingness to use new features means Android apps will fall further and further behind their iOS equivalents, unless Google manages – via carrot, stick, or both – to coerce Android carriers and manufacturers to prioritize OS upgrades. And that’s the core problem with Android. While there’s no doubt that consumers who’ve bought Android devices are being screwed out of updates that they deserve (the take up of Android 4.0 ‘Ice Cream Sandwich’ is pretty poor so far), the biggest risk from fragmentation is that developers will ignore new Android features an instead focus on supporting older but more mainstream feature sets. After all, developers want to hit the masses, not the fringes. Also, the more platforms developers have to support, the more testing work there is. OK, so Android is fragmented, and it’s a problem that Google doesn’t seem willing to tackle. But the more I look at the Android platform and the associated ecosystem, it makes me wonder if Google ever had any plan (or for that matter intention) to control platform fragmentation. But could Google have done anything to control fragmentation? Former Microsoftie (and now investor) Charlie Kindel thinks there no hope to curb fragmentation. In fact, he believes that most things will make it worse. I disagree with Kindel on this matter. He also believes that Google’s current strategy amounts to little more that wishing that everyone will upgrade. On this point we are in total agreement. I understand that Google isn’t Apple and can’t seem to sway the crowds in the same way, but it might start to help if the search giant seemed to care about the OS. The absence of enthusiasm make the seem Sphinx-like and uncaring. Why should anyone care about new Android updates when Google itself doesn’t really seem all that excited? If Google created a real demand for Android updates from the end users, this would put put pressure on the handset makers and the carriers to get updates in a timely fashion to users. Make the users care about updates, and the people standing in the way of those updates will sit up and pay attention to things. Google with Android OS is now in a similar place than Microsoft with Windows, and blaming Google to have this disparity of OS versions would be the same than blaming Microsoft on the fact that Windows XP, Windows Vista and Windows 7 are still co-existing nowadays. One reason Android got that 'fragged' is that it has to face a rapid evolution of hardware and new kind of devices in a very short time, somehow having a kind of Frankenstein-like experience with its Android creature. Many distinct hardware manufacturers adopt Android, develop their own GUI layer on top of it, making Google having a direct control on the spread of new Android version quite impossible... as each manufacturer may need to perform their own code update prior to propose a new version of Android on their own devices. The direct comparison with iOS is a kind of unfair as Apple do have a rapid update cycle by controlling every single workings of the overall mechanism: SDK regular updates push developers to adopt new features and forget about old iOS versions and new iDevice's Apps request the end-user to upgrade their iOS version to the last one in order to be able to install new Apps. Meanwhile, Apple is having control on hardware design, production and evolution too, making the propagation of new iOS versions much easier and much faster than it is for Google with Android. Then, mobile devices (smartphones or tablets) do have a short life timeline and this was already true prior Google and Apple starts acting in this market. So whatever your name is Google or Apple, considering not proposing the very last version of your OS on so-called 'old' or obsolete hardware is a kind of an obvious choice to do. This is not even a 'choice' but more a direct consequence of how fast technology is evolving nowadays. Now, smartphones and tablets hardware capabilities will reach a 'standard' level to become 'mature' products (all smartphones/tablets do have cameras, video capabilities, editing capabilities etc...) which may make easier for Android to spread over on all devices in a similar version while hardware evolution observes a pause. Already Apple's last innovations are more linked to software than real hardware (r)evolution, so Android may take benefit of this in order to reduce the gap. It’s not GC pauses. It’s not because Android runs bytecode and iOS runs native code. It’s because on iOS all UI rendering occurs in a dedicated UI thread with real-time priority. On the other hand, Android follows the traditional PC model of rendering occurring on the main thread with normal priority. There are also some other reasons, like inoptimal hardware. The NVIDIA Tegra 2 CPUs ubiquitous to many Android 3.0 tablets and some phones suffered from low memory bandwidth and lacked NEON media instructions, both of which ultimately presented a bottleneck to the Android user interface and experience. However, Android 4.0 remedies this by having graphics hardware acceleration, although as long as graphics aren’t given top priority (a la real-time), platforms like iOS or Windows Phone 7 are always going to be more fluid. The announcement that Nexus One users won’t be getting upgraded to Android 4.0 Ice Cream Sandwich led some to justifiably question Google’s support of their devices. I look at it a little differently: Nexus One owners are lucky. I’ve been researching the history of OS updates on Android phones and Nexus One users have fared much, much better than most Android buyers. This may be stating the obvious but there are at least three major reasons. The Samsung Behold II on T-Mobile was the most expensive Android phone ever and Samsung promoted that it would get a major update to Eclair at least. But at launch the phone was already two major versions behind — and then Samsung decided not to do the update after all, and it fell three major OS versions behind. Every one ever sold is still under contract today. The Motorola Devour on Verizon launched with a Megan Fox Super Bowl ad, while reviews said it was “built to last and it delivers on features.” As it turned out, the Devour shipped with an OS that was already outdated. Before the next Super Bowl came around, it was three major versions behind. Every one ever sold is still under contract until sometime next year. Besides the obvious platform fragmentation problems, consider this comparison: iOS developers, like Instapaper’s Marco Arment, waited patiently until just this month to raise their apps’ minimum requirement to the 11 month old iOS 4.2.1. They can do so knowing that it’s been well over 3 years since anyone bought an iPhone that couldn’t run that OS. If developers apply that same standard to Android, it will be at least 2015 before they can start requiring 2010’s Gingerbread OS. That’s because every US carrier is still selling - even just now introducing2 - smartphones that will almost certainly never run Gingerbread and beyond. Further, those are phones still selling for actual upfront money - I’m not even counting the generally even more outdated & presumably much more popular free phones. It seems this is one area the Android/Windows comparison holds up: most app developers will end up targeting an ancient version of the OS in order to maximize market reach. In the chart, the dashed line in the middle of each bar indicates how long that phone was getting any kind of support updates - not just major OS upgrades. The significant majority of models have received very limited support after sales were discontinued. If a security or privacy problem popped up in old versions of Android or its associated apps (i.e. the browser), it’s hard to imagine that all of these no-longer-supported phones would be updated. This is only less likely as the number of phones that manufacturers would have to go back and deal with increases: Motorola, Samsung, and HTC all have at least 20 models each in the field already, each with a range of carriers that seemingly have to be dealt with individually. Why Don’t Android Phones Get Updated? That’s a very good question. Obviously a big part of the problem is that Android has to go from Google to the phone manufacturers to the carriers to the devices, whereas iOS just goes from Apple directly to devices. The hacker community (e.g. CyanogenMod, et cetera) has frequently managed to get these phones to run the newer operating systems, so it isn’t a hardware issue. It appears to be a widely held viewpoint3 that there’s no incentive for smartphone manufacturers to update the OS: because manufacturers don’t make any money after the hardware sale, they want you to buy another phone as soon as possible. If that’s really the case, the phone manufacturers are spectacularly dumb: ignoring the 2 year contract cycle & abandoning your users isn’t going to engender much loyalty when they do buy a new phone. Further, it’s been fairly well established that Apple also really only makes money from hardware sales, and yet their long term update support is excellent (see chart). In other words, Apple’s way of getting you to buy a new phone is to make you really happy with your current one, whereas apparently Android phone makers think they can get you to buy a new phone by making you really unhappy with your current one. Then again, all of this may be ascribing motives and intent where none exist - it’s entirely possible that the root cause of the problem is just flat-out bad management (and/or the aforementioned spectacular dumbness). 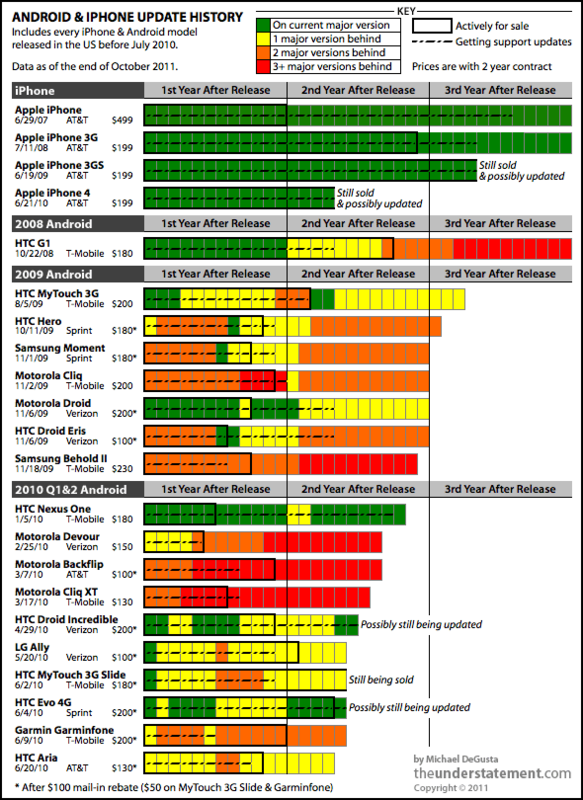 All of the even slightly cheaper phones are much worse than the iPhone when it comes to OS support, but it’s interesting to note that most of the phones on this list were actually not cheaper than the iPhone when they were released. Unlike the iPhone however, the “full-priced” phones are frequently discounted in subsequent months. So the “low cost” phones that fueled Android’s generally accepted price advantage in this period were basically either (a) cheaper from the outset, and ergo likely outdated & terribly supported or (b) purchased later in the phone’s lifecycle, and ergo likely outdated & terribly supported. Also, at any price point you’d better love your rebates. If you’re financially constrained enough to be driven by upfront price, you can’t be that excited about plunking down another $100 cash and waiting weeks or more to get it back. And sometimes all you’re getting back is a “$100 Promotion Card” for your chosen provider. Needless to say, the iPhone has never had a rebate. Along similar lines, a very small but perhaps telling point: the price of every single Android phone I looked at ended with 99 cents - something Apple has never done (the iPhone is $199, not $199.99). It’s almost like a warning sign: you’re buying a platform that will nickel-and-dime you with ads and undeletable bloatware, and it starts with those 99 cents. And that damn rebate form they’re hoping you don’t send in. Why stop at June 2010? I’m not going to. I do think that having 15 months or so of history gives a good perspective on how a phone has been treated, but it’s also just a labor issue - it takes a while to dredge through the various sites to determine the history of each device. I plan to continue on and might also try to publish the underlying table with references. I also acknowledge that it’s possible I’ve missed something along the way. For the major Android version release dates, I used the date at which it was actually available on a normal phone you could get via normal means. I did not use the earlier SDK release date, nor the date at which ROMs, hacks, source, et cetera were available. Finally, it’s worth noting that people outside the US have often had it even worse. For example, the Nexus One didn’t go on sale in Europe until 5 months after the US, the Droid/Milestone FroYo update happened over 7 months later there, and the Cliq never got updated at all outside of the US. Thanks primarily to CNET & Wikipedia for the list of phones.? Yes, AT&T committed to Gingerbread updates for its 2011 Android phones, but only those that had already been released at the time of the July 25 press release. The Impulse doesn’t meet that criterion. Nor does the Sharp FX Plus.? A couple of samples just from the past week: 1, 2 - in comments. ?